I love the Baroque. From Rubens and Caravaggio to Bernini and Bach. I love the passion and the movement. I was visiting the Metropolitan Museum of Art in New York and was taking with my wife about composition in paintings and explained how the baroque movement took spaces that were normally very solid and stationary and put them on a diagonal, giving them dynamic movement. We went into one room full of great pieces from the era and every single painting in the room had the same basic composition. but you will see this used again and again. 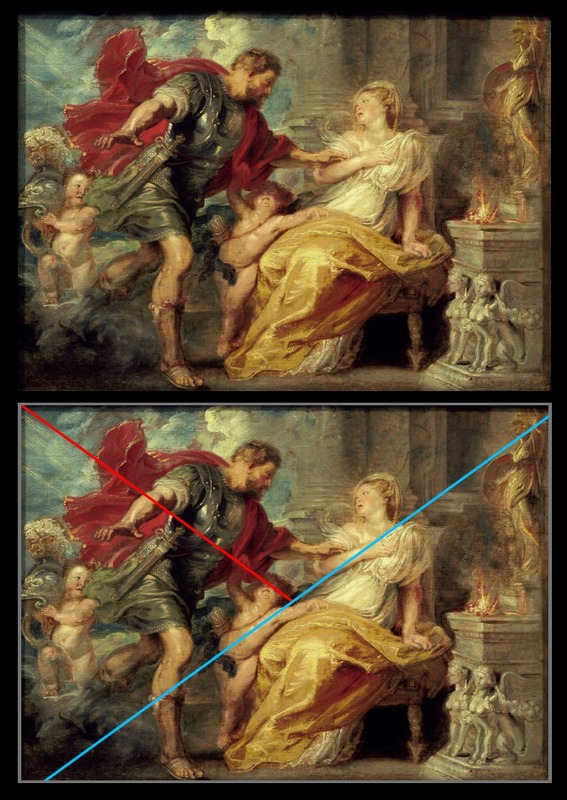 the right, by Rubens, uses two diagonals and a more dynamic composition. lines made by the legs, the arms and the cloth that all echo the main diagonal. cupid’s head and down to Rhea’s hand. place beautiful curves and accents that play against diagonals. Great stuff. upper left, and the leg to the lower right. Those lines both branch out from the main diagonal. creating less regular triangles, but still using the same basic approach. great romantic baroque piece. Solomon J.
shapes and lines are clearly planned. the spiral, or echo it. I love how the characters shape in the bottom left reenforces the spiral shape, as does the rug. 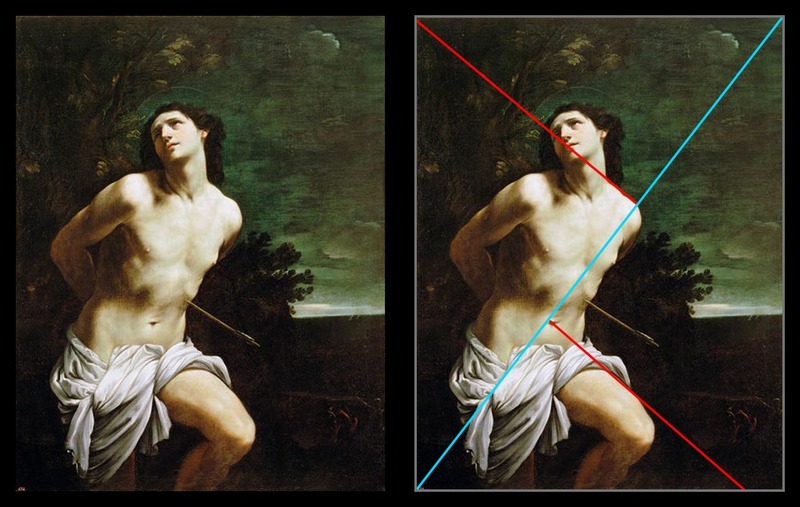 Samson’s tormented face falls right on the primary vertical dividing the painting by the golden ratio. came before us. I know it has for me. I will sometimes take the opportunity to really study an old Master when doing a commission. I love the beautiful painting by Caravaggio. I was given a commission that called for a group of figures to be seated at a table and decided to turn in into an unlikely homage. 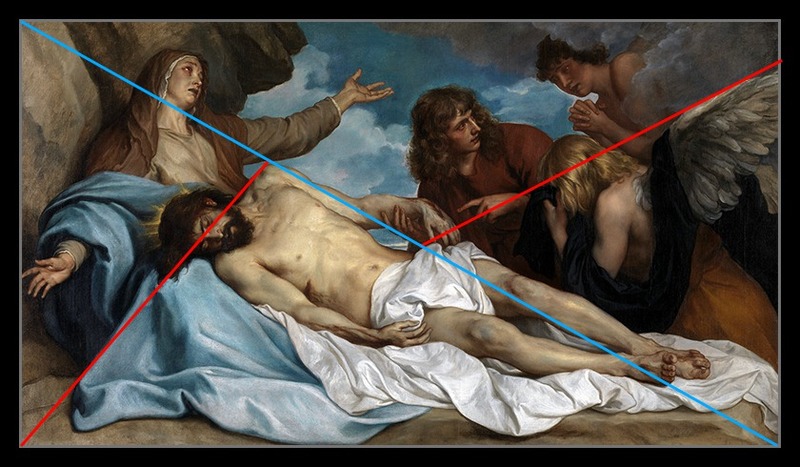 You can see from the lines I overlaid that I used the same composition as the in the Caravaggio, and the other paintings in this post. It helped me to gain a little more appreciation and understanding. If you decide to give it a try, I hope you will let me know. I would love to see it! Howard began his career working in the video game industry. After 13 years working as a texture artist, concept artist and then art director, he left to pursue illustration. 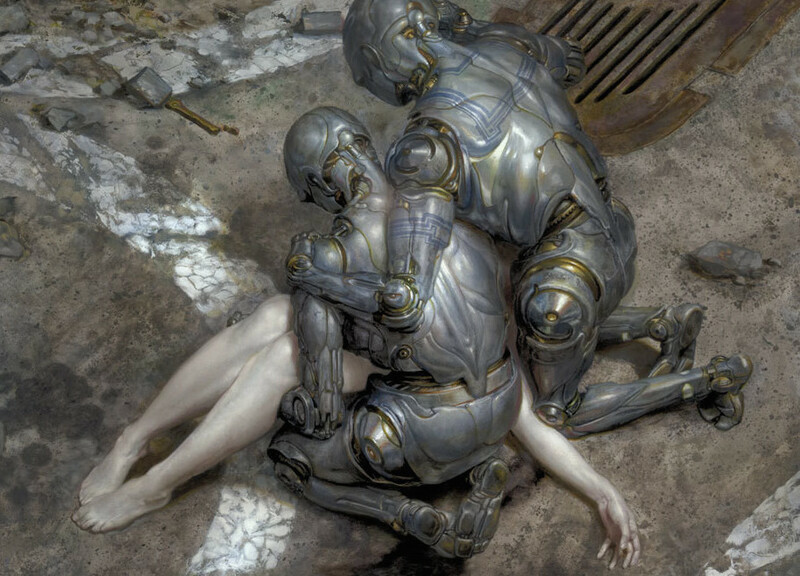 He has worked for clients such as Blizzard, Upper Deck, Wizards of the Coast, Electronic Arts, NCSoft, The Greenwich Workshop and Paizo Publishing.He was a finalist in the Art Renewal Center 2011 - 2012 Salon in the figurative category, won an honorable mention in the Oil Painters of America 2011 Online Showcase and a Merit Award in the Springville 2011 Spring Salon. 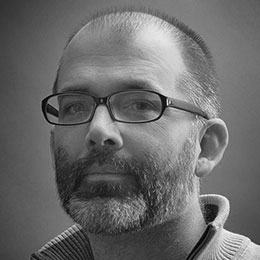 His work can also be found in various years of the Spectrum annual and was nominated for a Chesley Award in 2011.He is very passionate about learning, studying the great artists and techniques of the past, particularly Caravaggio, Bloch, Bouguereau and Waterhouse.When not painting or drawing Howard loves spending time with his wife and three kids, cooking, and trying to bake the perfect loaf of bread. PreviousOops! I Lost All My Photos! I've got to say, while I usually adore Muddy Colors posts and only comment to applaud or contribute to the community, this post really grinds my gears. Art books are full of these diagrams. Art historians (who rarely paint well themselves) are often overly fond of them and cite them in a way that reinforces their credibility like some kind of insidious meme. But, while some do make sense, most are essentially compositional lay lines. Just as our facility to find patterns in the semi-random allows for, say, a lay-line map of car parks or call boxes, these diagrams are usually nonesense. The paintings structure having far more to do with other factors, often practical or personal and forever known only to the artist, sometimes not even then. I'm with runninghead on this one. 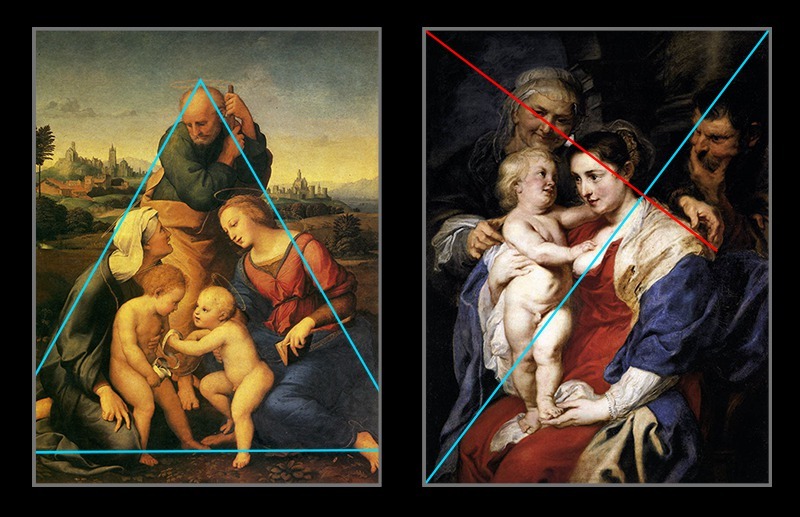 I agree with the triangle one but I could lay out archetypal composition lines on top of many of the baroque ones that work as well as the diagonal with two other diagonals. I think that a lot of the “conventional wisdom” about composition and leading the eyes around is based around outdated concept that is being proven wrong by studies about eye tracking. Thanks once again for the thoughtful post Howard. And while I agree with runninghead to a great degree I also believe that posting here can really be about sparking discussion. Your posts have that quality of challenging and going out on a limb. Having said that the line thing is tricky. If you try to give it as an assignment to 20 students you generally get 20 different solutions. Is there a right or wrong diagram? Or is it important to just look at it closely enough to find directional masses and edges. Is it harmful to try and break down any piece like this? Can it steer someone wrong? I love posts that might make us ask questions. Thanks for the reply! I don't disagree with much of what you wrote. Sorry about the wear and tear on your gears though. Definitely not my intention. I did write that “Of course there is a lot going on outside of these lines…”. I didn't say that these are the only factors in the composition, but I do believe that in many of them the structure is there. I also believe there is a benefit to using it as a tool to construct. I appreciate the feedback. There is definitely a lot going on in all of the paintings above that happens outside of the simple lines I put on them. Sometimes it does seem like palm reading when I look at compositional diagrams. I am confident in the composition that I outlined though, in that it is the base structure of many paintings, especially in the 17th century. On that point we might have to disagree. Great questions! I could be totally out of my gourd. Maybe history will find me sitting in a corner, clutching my knees, mumbling to myself and occasionally yelling “the diagonals!”. For now though, I think that there is value in both analyzing the depth of the work, but also in simplifying and looking for the “gesture” of the piece. I find this particular gesture often from this era. Hopefully it does more good than any harm to do so. The diagonals!! Just to be clear. I've nothing but respect for Howard and, without seeking to “troll” as I believe it's called, I do, also, love it when a post incites thought and discussion. I believe this is a very interesting area- despite the fact that so much has been written previously on the subject of composition, both practice and history, it does appear to be entering something of a renaissance. Eye-tracking and facial recognition, advances in cognitive science, etc, all seem to be contributing. Even at home we can all now try running the Median filter over these old (and new) master works to examine the role of positioning and simple Shape in compositions, or apply the same rules to advertising images, paintings by children, etc. I'm not being flippant. I suspect that there actually are definable rules to find similar to those demonstrated in the post. While much may remain subjective, the next decade will show, with more scientific reliability than ever before in history, exactly what they are. I think, if a person draws and paints a lot, and has been exposed to the compositional theory, they will find themselves using good composition instinctively – for the same reason that a person who reads a lot will instinctively have better grammar than a person who doesn't. The principals sink in, and what's 'right' will become second nature, what's wrong just isn't as pleasing. When Japanese artwork first hit Europe, with its apparently random compositions and characters partially out of frame it shocked people and seemed to break the rules. But in Japanese art the 'negative space' is as important to the composition as the 'positive space' so it actually does have 'rules' and good and bad composition again are sensed if not clearly articulated in words. I am surprised to find such opposition to the theory presented in this post. I found Howard's observation to be quite informative and potentially helpful to myself and others. As an artist, when approaching a large canvas, it can oftentimes be overwhelming. I believe the diagonal approach is a viable technique to both, divide the plane and deviate from the symmetrical composition so commonly taught. With the subject in mind or sight, using this composition would restructure how an artist could place those subjects to fill the layout. What is the subject's relationship to the viewer? To their environment? What feeling does this convey? Yes, this is where the artist's unique input is the ultimate variable. With the technique offered here, I now see the directional cues in the lighting that add more validity to this concept. I also see how this composition being used to add movement and depth to environments when combined with perspective (which is another beast). Using the suggested 20 students as a control group, I see 20 different conclusions (or even 200) as a positive progression. This could explain why countless numbers of renders (thumbnails, frames, scenes, etc.) where created to express ideas and theories such as the one presented here. In conclusion, I feel we must remember that any prior technique, concept, or idea discovered is merely a tool, not a requirement, for future creation. I follow Muddy Colors regularly, but this is the first time I felt the need to comment. I am not a working artist, so I'll ask forgiveness of any inaccuracies up front. First, I found the article to be helpful both in approaching the works of the masters and hopefully gaining a deeper understanding and appreciation for the decisions they've made as artists in creating their works. As R. Herod said above, these are tools. 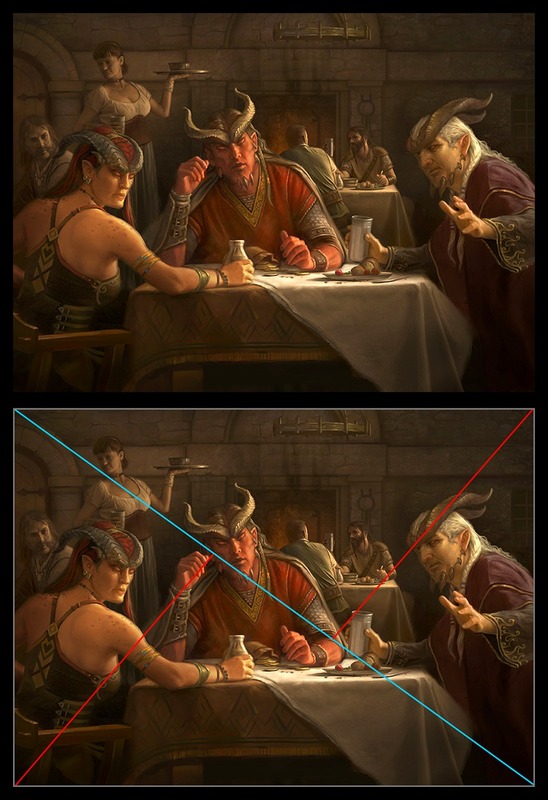 As an amateur artist who struggles with composition and perspective, I found the post enlightening. I do agree that most of the books I've read and lectures I've attended on composition make tools such as the golden ratio appear to be the end all and be all of composition and if you don't get it or follow it, then your art will surely fail. That attitude I definitely disagree with, but it was not present in Mr. Lyon's post, so…that's my two cents worth, and I thank you for teaching me/reminding me of a tool that is available for anyone willing to give it a try or use it to appreciate the art of others. Thank you for a wonderful post and great discussion in the comments! Your reference to gesture says a lot (from Bill's comment). Whether or not these types of underlying compositional structures actually lead the eye around, as we have been taught, or are de-bunked by eye tracking software to me does not matter. I think Howard has demonstrated that there is a structure to these works, whether it is line, shape, gesture is open to interpretation by any individual. 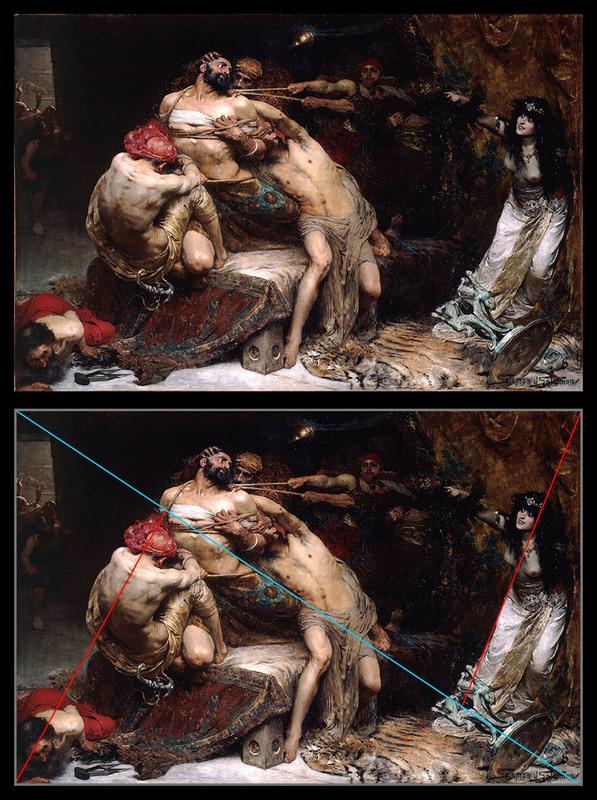 Even if eye tracking software shows that our eyes move through a composition (randomly or otherwise) ignoring the artists intentions and underlying structure I believe it is still true that having some kind of 'rules', whether set by the artist or some historian, is what makes for great work. It is what makes us want to stay and look at a painting longer. Work devoid of any good structure, or some other quality, and we move on. If the engineer is concerned with the science or mechanics of the 'hows and whys' of it all the architect is concerned with how it is put together visually. After all is said and done we still need this. Who knows where the science of eye tracking will actually lead in relation to art. It's too early to tell right now. Could it end up as some little footnote in the history of computers that amounted to nothing? We'll see. Think of scientific theories from a hundred years ago that are now laughable. Even science is subject to interpretation and being discredited or proven wrong later. Science is not an exact science (sorry scientists). It seems to me (based on history) that even science has its trends or 'what is fashionable today' and has a lot to do with its current technology, which will also change over time bringing with it a whole new set of theories. For us artists just keep doing what we do. That is probably why these examples in this post have such staying power. I absolutely read your post as sincere and I appreciate the response! I love the discussion. I think I could have started out, or summed up my post with a little more precision: There is structure in a painting (and here are some Baroque examples). As far as eye-tracking and composition, I actually see those two things as separate. For me the composition isn't what leads the eye, it is the underlying framework that all the imagery is built around. I love to see, in many of the paintings here, how the figures are bent and turned to enforce lines/shapes/movements. You know being out of one's gourd can actually be a good thing. We look at things differently. And there can never be anything wrong with truly attempting to analyze a piece. The thing I worry about would be relying on diagramming as the “right” compositional solution. As a tool it can be wonderfully revealing, as a science possibly limiting. Like I said discussion is a great thing. I'm concerned that the length of our comments in this thread may deter some readers from engaging with it, so I'll try to be brief. I must provide visual examples soon, somehow. In the meantime, let's test the validity, and utility, of the examples above by drawing over them. While much does happen outside the lines, for me it's far too much for the theory to hold together. Look at the originals. As far as possible, ignore what you have been directed to see by the superimposed diagonals. Draw, with a pencil & ruler or with bezier curves, lines of your own over the top. Many of your lines will necessarily be approximations, generalisations of elements and gesture, but it's still a worthwhile exercise. Would you have honestly found the same diagonal structure in these images yourself if you'd not read of it beforehand? If not, how good an approach is it? I'd say one has to ignore far too many inconvenient elements for the diagonals theory to be useful or accurate. I use compositional tools myself- asymmetry , swooping curves, rule of thirds, Golden Section, etc. I just believe that the ones described in the post are misleading and counter-productive, no disrespect intended. Well, so much for staying brief, though it would've been worse if I'd started chasing David's “science” rabbit! Anyone interested enough to experiment can meet me back here and we'll compare results. I believe that the author has a perfectly stated understanding of these design structures. “… simplifying and looking for the “gesture” of the piece” is a wonderful description of an early stage of dissecting a design frame for a piece. I spend a great deal of time studying the designs within the art of a particular artist and come across obvious main lines all the time. “think of composition lines like coat hangers.” – I usually do precisely that. Thanks for the response. I think the questions you are asking are great! I have a mental checklist of questions I run through when I am painting. It helps me to take what I hope is a fresh look after I have been working on a sketch for a while and hopefully add more interest. Thanks again! I am glad that you jumped in to comment and I hope you will participate more in the future! 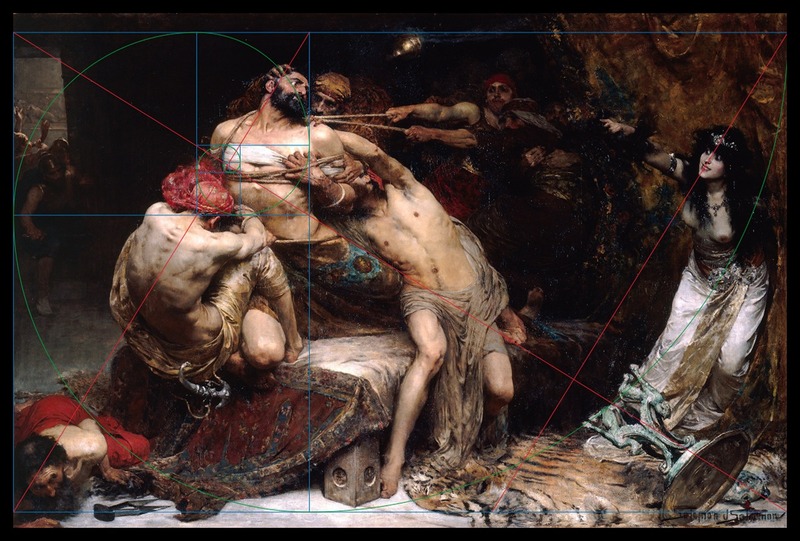 I know what you mean about the golden ratio and composition. James Gurney had a great post that pointed out many times that it has been attributed erroneously. That being said, it doesn't mean that it has not been used in the past either. It is, as you point out, a “tool”, nothing more, neither good nor bad. That determination is on the artist's shoulders and how he/she uses it. Thank you and please keep commenting in the future! Great idea! 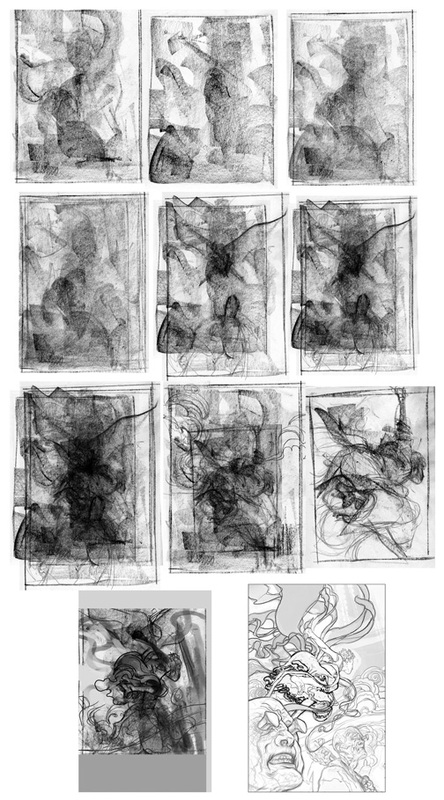 I would add, that at least to keep in a similar mind set that I approached these, to try and represent the gesture of the painting with 2 or 3 lines. You don't have to of course, but the comparisons to what I did will start to diverge from the philosophy behind my observations if you use many more. The reason being that I wasn't looking for all the contours and flowing lines to move the eye, but the large scale structure around which the painting is built. More looking for the forest instead of the trees. It might be interesting reading about 'Gestalt Psychology', specifically 'reification'. I am sure you will be familiar with the ideas, even if you might not know the specific terms (and you may very know them, I am not assuming that). They deal with how our mind constructs lines/shapes that are implied. I am contending that in the paintings above and many others, there is an implied structure that is construed from the careful arrangement of the figures, cloth, and other forms in the painting. Additionally, in the 17th century (though not exclusively) it is often based around the first diagram in the post, if not explicitly, then close to it. Probably more important than any specific painting, is asking the questions, do some paintings have a deliberate structure and if so, is it beneficial? When I say deliberate, I mean more than the artist composing, but deciding to build the composition around a specific structure. I do find it beneficial. I feel that it brings an underlying order to my work that I find pleasing. It also helps me build complex images (my last painting was 4 x 15 feet and had 68 figures in it, I will post images when/if the client allows) with a strong sense of arrangement. Thanks for the continued discussion! Thanks David for the response, you helped me clarify some of my thoughts with structure! Kurdish, arab, turkish :Arab men A person must behave like a person It's this that my images is all about. Arabs image variety by Azzedine Jamal's there. I think you are passing through a phase in your understanding of composition. With continuing interest, I believe you will undoubtedly pass through other phases, each superceding the previous, each belief state fostering the heady belief that you have really hit upon some deep quality in art that has enormous explanatory power. And this belief will act on your mind like all ideologies do; it will make you feel compelled to advance the ideology. In my experience, after running through a number of these ideological belief states, I circled back to the philosophy of epistemology, which advises us to challenge our belief states to the very core, and to be more interested in defeating one's beliefs than propagating them. And the surest way to defeat a belief is to put it to its ultimate test, isolated in practical application (which usually takes considerable engineering and creativity to devise). As the ancient philosopher said: True knowledge produces great works. That is the only way true knowledge is known to exist. Everything else is merely claims. My experience is similar to yours. I find myself adding and subtracting to the ideas and sources that inspire me. The surest way to prove a belief is to put it to the ultimate test and put into practice, which often takes great discipline and endurance. And you are right, that is the best way to also find out if it is deficient. I have no doubt that I will change as I work, search and discover. I don't anticipate that I will burn down each idea as I progress. Some will prove useful and some will pass by the wayside. One day I was in the Norton Simon Museum in Pasadena California. As I walked through the exhibits, I was stopped cold by a painting by Degas. It was a painting of a woman sitting on a bench next to a young girl putting on her ballet shoes. The painting was across the room, but it still affected me, I couldnt stop looking at it. Now you can use all the eye tracking software or scientific tools you want, but it will never explain why that painting was so arresting. Degas command of dividing up the space on his canvas was the tool he used to stop me in my tracks. Composition is the tool we use to quietly affect the emotions of the viewer. Along with composition in value and color. I understand Howard, your joy at looking at these paintings and finding an underlying structure in them. It tells you that the artist was attempting to affect you, even today, with his work. All do respect to science, I believe composition is designed to speak to our emotions, our gut, and is a tool that has been used all through the history of art. OK, I've done some analysis on Howard's examples (bit rudimentary but had to give it a shot). I've tried to do an unbiased job of it, if you see what I mean. I've sent them to Howard at his site address. Not sure what else to do with them yet as I'm unsure whether posting them on my own blog would be right. 1) Check out Howard's site- it's awesome! 2) Previous comments addressed: Reification, negative space, spam, tilting, science. Loved your last comment Howard, the gestalt and reification references both particularly useful. Also, that painting sounds truly epic, in every sense! Can't wait to see the plan and execution on that one. Would be interested to learn whether you found some hierarchical structuring useful or if you used other ways of handling the complexity (aside from those methods discussed so far in this post). Beautiful work by the way. On another note, in some ways I think using classical references puts us in the same position as a Jimmy Hendrix tribute act. Unless you really are pretty damn good it just invites negative comparisons. That your work, like that satyr piece above, still stands up so well alongside the old masters is testament to it's incredible quality. I like Elena's comment about negative space. It does change the way we look at the examples (and anything else). The margins between areas increase in importance. Rupiya- not sure what you mean there (is this spam?). David- To expand on my earlier reference to Science. I just mean I can see a more modern approach to compositional theory being developed now. Imagine leaving these diagrams aside in favour of an approach based instead on directional flow and 'gravitational' values. We know from recent findings that faces and areas of strong contrast don't just interrupt the linear effects of compositions, they blow them away. So a face or area of high tonal/color contrast distorts linear composition “coat hangars” the way massive bodies distort the path of light in space. A useful theory of composition must account for this. I won't try to predict where the current research is leading to and I'm not saying we shouldn't use lines to develop, or read, compositions. I'm just saying- we could do so much better than these old diagram based models now. They all seem a bit too “Da Vinci Code” to me. Obviously it's my conclusion that, for diagonals to really be the basis for these compositions, we have to force the evidence to fit the theory. Great research! It's strongly helpful. Thanks for sharing! I wholeheartedly agree with you, Steven! The same thing happened to me when I saw some of Degas' works, but at the time, I didn't know why. But the ones that affect me the most are the Baroque pieces, and I do not doubt that the dynamic nature of the composition, along with the drama taking place are what attract me. The diagonals in the composition complement the action in the image. 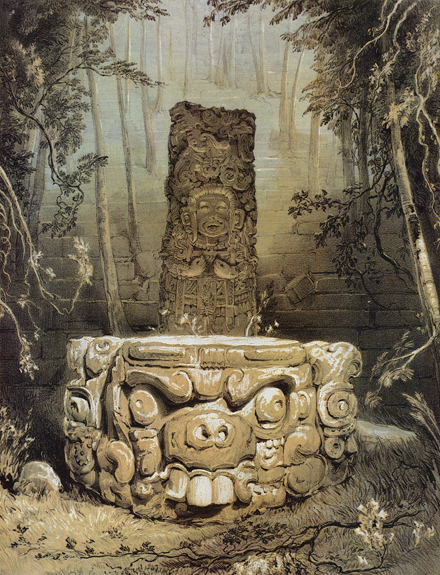 Most viewers do not know why they are so captivated by a piece, and many will deny that there was a plan behind the composition and/or the placement of everything in the image. But being an artist (a student), I must say that absolutely everything, including composition, is carefully planned. That's what makes a great painting! I loved this article…actually, I love reading articles about this type of thing. It seems to speak to that methodical, process-oriented side of my brain. You have done a really nice job here. You're correct to distinguish the underlying form from the line of continuity or movement, which may be placed upon the underlying structure. Often such movement does make partial or full use of the underlying structure as well. 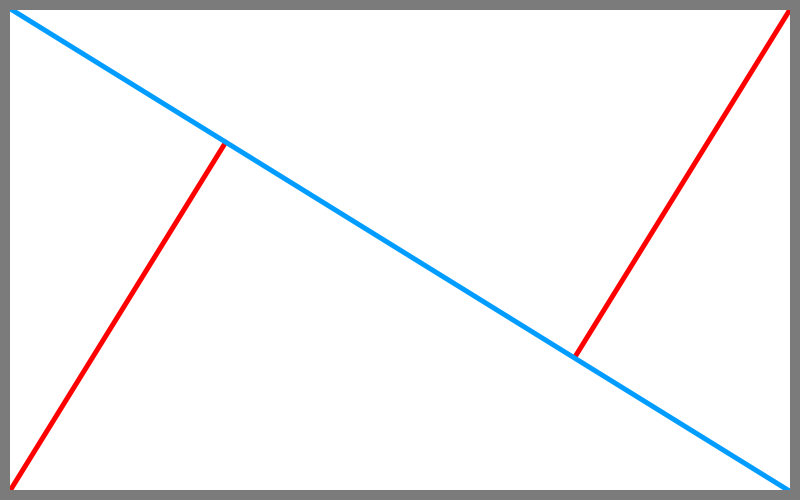 Many of the zig-zag compositions can be tricky because they often work in union with other devices, such as a triangle or square; or a roughly configured golden rectangle. 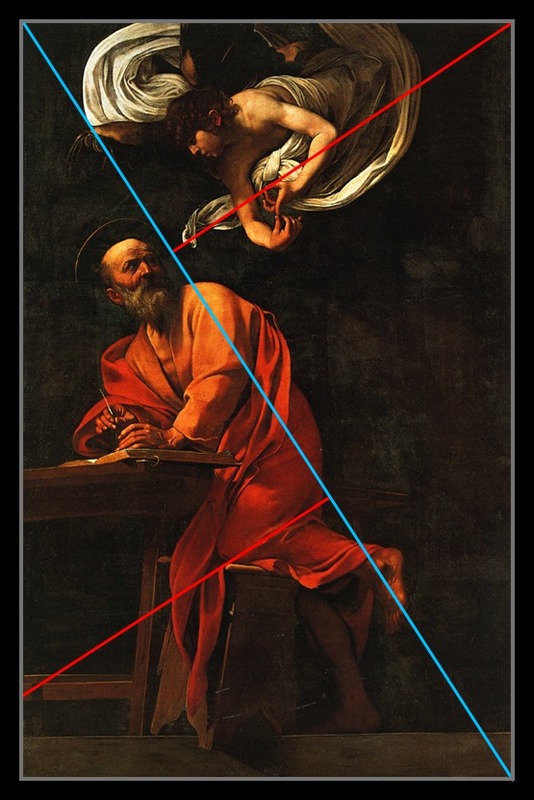 The upper leg of the zig-zag in the vertical position often accommodates an angel or heavenly intercession, as does Caravaggio's St. Matthew above. 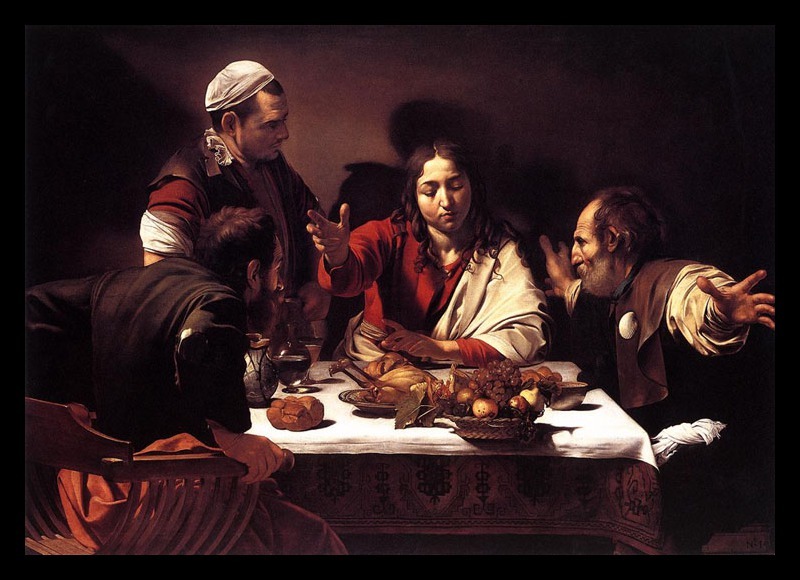 Caravaggio's The Supper at Emmaus, also uses some centered triangles based at the lower corners and the center line figures strongly in the design. It's not uncommon for master artists to employ multiple devices as you noted in the Solomon. Artists and eras can be identified by the form of their underlying structure, just as easily as they can be by their palettes, materials, subject matter, moods, figurative style, etc. If the subject under discussion were music there would be no doubt. Your simplification of such zig-zagging compositions is much appreciated. 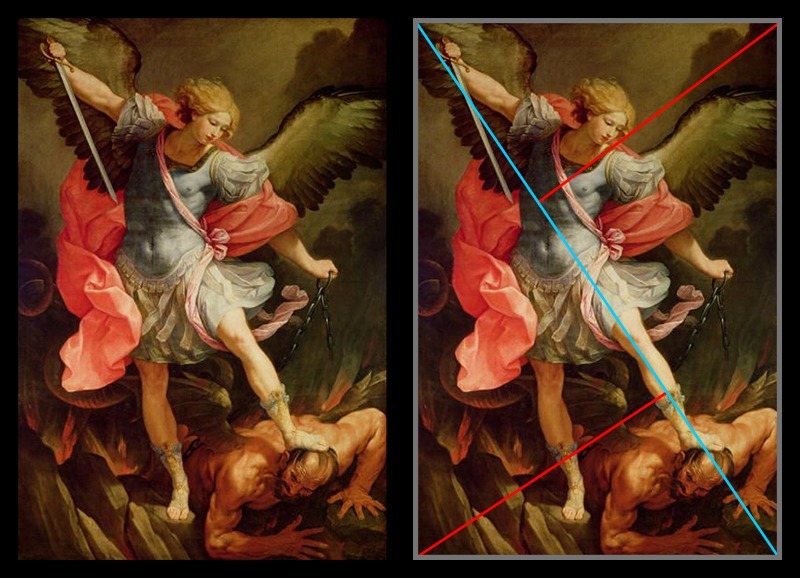 First off, the golden rectangle you “dropped” in this painting does not match the perimeter of the painting. In other words, you have sized and placed the rectangle and spiral to fit your description. This is not to say that you are not onto something, but you need hard evidence to prove it. Where are the preparatory sketches or x-rays showing the existence of this grid or armature? Where are the logs, written records or recorded conversations about the use of such devices? Coincidence does not imply correlation and correlation does not imply causation. Where are the historical citations? As far as I am concerned, your analysis is no different from finding mythological gods and creatures in the constellations at night. This is not to discourage your curiosity–many important discoveries start with recognizing patterns–but it is important to not poison the well of knowledge with misinformation. How do you know you are not chasing after a red herring? After sifting through thousands of articles from science journals at the university library, I am more and more convinced that the great masters DID NOT regularly use the golden section in composition. 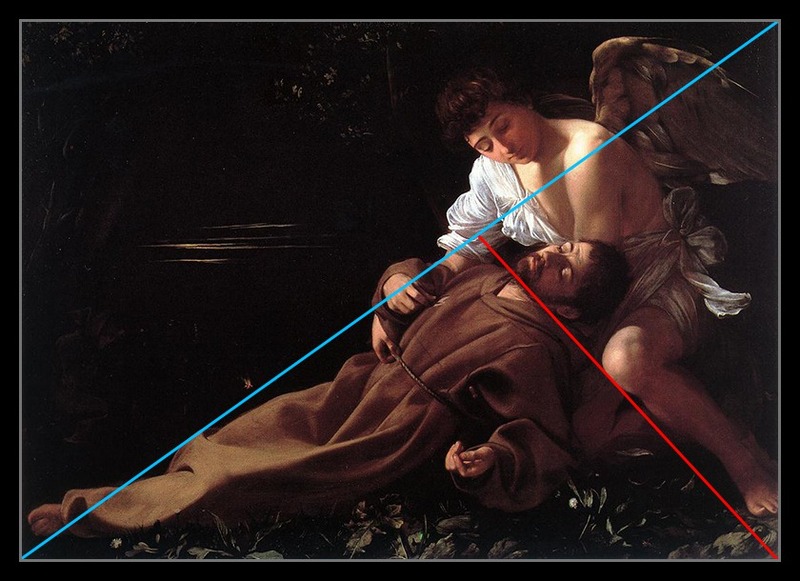 It looks like this idea that artists from 1450 to 1750 used the golden ratio is a a complete fabrication. It's a myth! Artist James Gurney came to the same conclusion: It looks like this myth grew legs circa 1810. Apparently, the two parties responsible for proliferating this myth are German psychologist Adolf Zeisling, Swiss architect Le Corbusier and the Bauhaus artists. Later, in 1946, Matila Ghyka's use of harmonic analysis with rectangular armatures may have also contributed to this misconception. 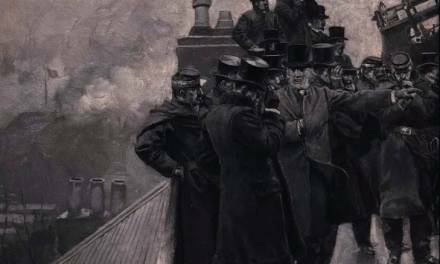 James Gurney quotes some credible sources that debunk the idea that the golden section was used by the great masters for composing the layout of their paintings. You have taken statements I made from two places in the article and run them together, making it appear as if I stated something about the use of the golden rectangle that I did not. My quote “There are no happy accidents here. All of these shapes and lines are clearly planned…” was not written about the golden spiral/rectangle, but about the use of the diagonals as diagrammed. My laying it on top of the Solomon piece was a side note that that found interesting. The main thrust of my post was not about the golden rectangle/spiral. I stated that it was “interesting” and used the phrase “I think” to convey an opinion. You said “First off, the golden rectangle you “dropped” in this painting does not match the perimeter of the painting”. Who says that it has to? I think it can be used within the boundaries of a painting as well. Gurney's post is awesome, and I agree with it. That doesn't mean that it was never used, and Gurney's post doesn't make that claim either. Howard, thank you for this post which has given me one more tool to use in composing my pictures. I have studied art for most of my life and composition is to me the most elusive of the elements that make for a successful picture. I'm happy to see that I'm not the only professional artist that is in pursuit of the truly golden rule for composition. I'm not persuaded by the alleged dynamic proportions of these images because I hold a BFA and consumed a semester's worth of Sacred Geometry in Art conducted by a doctor whose expertise in this subject originated in Mayan architecture. As a result, I would need to see the dimensions of these images to verify if there is any truth to the content of this post. ashley b on “The DragonSlayer”This is awesome!! I do love how you kept the face hidden. Love the lighting, thanks for sharing!